From a purely visual point of view, the Memorial Day ceremony at Henri-Chapelle American Cemetery is arguably the most impressive. When one stands on the esplanade overlooking the cemetery, one cannot help but be moved by the scale of the lives lost. As the largest American cemetery in Belgium, 7,992 servicemen are buried here. Of those, only one percent of the graves in this cemetery are unknown. 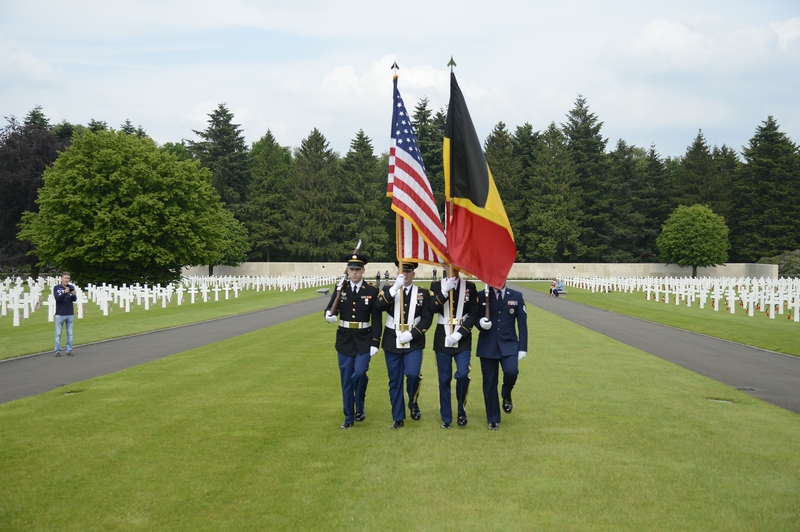 Each year, the Memorial Day ceremony at Henri-Chapelle welcomes more next of kin than any other ceremony in Belgium. Oftentimes, these next of kin are sons or daughters of the men buried there. Each year, school children from the local communities that surround the cemetery compose and recite a reflection, in French, that they compose on the subject of remembrance. Their remarks are inspired by a meeting with AOMDA and several serving American military personnel. Geographically, the Henri-Chapelle Cemetery straddles three separate communities in Belgium: Aubel, Welkenraedt, and Hombourg. In a three-year rotation, the mayor of each of these communities acts as a local “host” of the ceremony, holding a village wreath-laying ceremony and reception after the Memorial Day ceremony itself. All three communities in Henri-Chapelle are strongly committed to AOMDA and the annual Memorial Day ceremonies. On a historic note, the first Memorial Day ceremony held at the cemetery was on 30 May 1945 in the presence of General Dwight D. Eisenhower and General Omar Bradley. A piece of the podium that General Eisenhower stood upon during the ceremony can be viewed at the nearby Remember Museum.